It’s something I’ve considered since I started this blog. 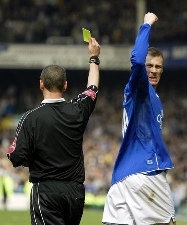 Using the name “Duncan Ferguson” for much longer might not be good for my health. It seemed like a good idea at the time, what with ridiculous notion prevalent among certain Evertonians of the divine attributes of Big Dunc. It was also a good private joke among Americans. One of my few readers, a great friend of mine, who took the time to research where I was coming from, also suggested that I change, and I took his advice that I was already minded to do. I should leave Duncan be and construct my own identity. Once again, I should thank Doze for his excellent idea. The FFF was 99.9% American but they did for a short time include an evangelical Scottish poster, who called himself Peterspeed. I did receive a private message from this person asking me if I was indeed the Duncan who used to play for Rangers. Priceless! Hi Duncan, I don’t know if this interests you, but I just want to ask whether you have ever read any of Terry Jones’ articles? They were accessible on the internet a few years ago, but I can’t find them now. I assume he stopped writing. Do you know? Jones has published a number of articles on political and social commentary, principally in newspapers The Daily Telegraph, The Guardian, The Independent, and The Observer. I think this is the Terry Jones of Monty Python fame. For a while he was prominent in the anti-war movement and I did see him write about it in the Guardian or Observer (wouldn’t touch the Telegraph with a barge-pole). Apart from that I don’t recall his views. I’m terribly worried that you may be losing your grip on reality. Now I don’t want to be a wet blanket, Tony, but was it a leprechaun who suggested this idea to you? Since the Second World War, the US has bombed China, Korea, Guatemala, Indonesia, Cuba, Guatemala (again), Peru, Laos, Vietnam, Cambodia, Guatemala (third time lucky), Grenada, Lebanon, Libya, El Salvador, Nicaragua, Iran, Panama, Iraq, Kuwait, Somalia, Bosnia, Afghanistan and Yugoslavia – in that order – and in not a single case did the bombing produce a democratic government as a direct result. Why do you think it will be any different in Iraq? Or did your fairy godmother promise you this along with a golden coach? Hasn’t anyone told you that they’ve been debating how to use the Iraqi oil field money in the White House for months, and there is a strong body of opinion that thinks it’s a good idea to use it to cover the expense of the US military operation, which, let’s face it, is going to be colossal. $6-$9 billion a month – that’s a lot of money for a nation in the economic mess George W Bush’s America is currently in. And what will replace the UN, in Mr. Perle’s fairy tale world? Why the good ole USA of course! It will administer worldwide justice and punishment in the interests of “a new century favourable to American principles and interests”. Not much comfort there for us elves and brownies. And, Tony, I hope you didn’t persuade Clare to stay in your government by promising that she could be in charge of all the UN reconstruction and humanitarian aid, because you know that’s only going to happen in dreamland. Mr Bush and his chums want this to be an exclusively US business. They’re only allowing American companies to bid for the 640 million worth of reconstruction planned (paid for no doubt by Iraqi oil) and that includes running the health and education services. Poor Clare is going to have a big empty office and nothing to do in it. So all little Clare Short will have got for compromising her principles and making herself a laughing stock is a short trip to Washington and somebody else’s hanky to blow her nose in. And I bet you don’t make her Deputy Prime Minister in the next reshuffle. Now I can’t believe that you have done any of this deliberately. It must be those fairy folk, whispering in your ear. So why don’t you look into your heart and see if there is any glimmer of truth and honour left in there, and then chase those goblins and elves away. It could just work. Unfortunately, I missed “Broen” last night, so I don’t have an opinion, but I will surely watch the next episode and a possible re-run of the first.